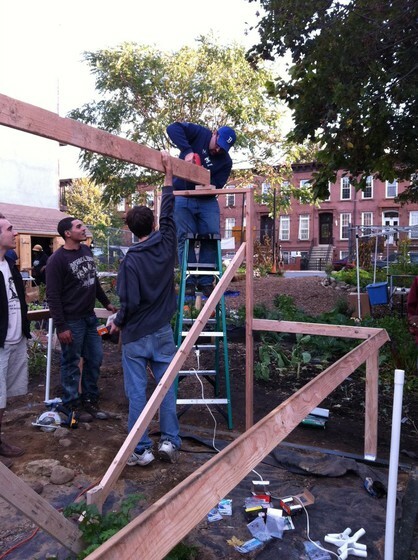 Prior to making a funding approach to the Foundation, Associate Director Ben Shepherd had been working with the Bed-Stuy community garden in Brooklyn, New York, for three years. The award helped him fund a starter greenhouse for the community garden in a neighborhood traditionally at risk for diet related diseases. The Bedford-Stuyvesant (affectionally known as “Bed-Stuy”) neighborhood is a center for Brooklyn’s African-American population and also represents one of NYC’s greatest at risk areas for diet-related illnesses. The Hattie Carthan Community Garden located in Bed-Stuy, has a rich history and runs one of the largest and strongest farmers markets in the area. Unfortunately, the garden’s tool shed was burned down and all gardening supplies and equipment were lost. Seeing the effects that followed in his Brooklyn community, Ben led an initiative for starter funds to co-design and implement new green infrastructure for the garden. After successfully raising money through ioby, an organization that connects New Yorkers to environmental projects, Ben and various community members successfully rebuilt the Garden.